It's not too often that I use cookbooks in my cooking and no it's not because I think I'm such a good cook that I don't need one! :) Most of the dishes I prepare are ones I've done often enough to know them without a recipe. And otherwise it's because I just don't have the time so I kind of throw things together and do what my head and heart tell me- that usually turns out well. Once in a while I just get lost in the creativity department. When that happens I turn to my pile of cookbooks for inspiration and it's usually the perfect push I need. Recently this has been happening quite a bit so I've been pulling out some of my favorites. At this point I have a pretty big collection of cookbooks but I know which ones I can rely on any time. Some of these are old, some are pretty new and others are from the local library. Yes I said it from the library! To me this is the easiest way to enjoy a cookbook without spending a fortune and once I'm finished with them they can go back with no further thought instead of adding more clutter to my already full collection. These 8 have been the ones I've been turning to the most lately. 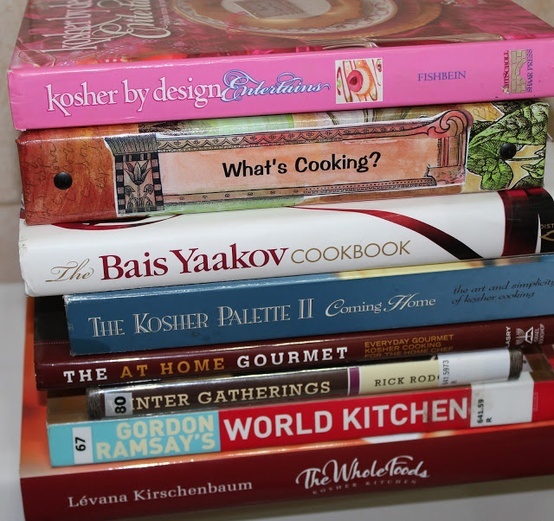 1) Kosher By Design Entertains By Susie Fishbein- This cookbook is pure elegance. When I am entertaining guests this is my first choice! There are great photos and quite a few very original recipes. This one was a gift from my husband a couple of birthdays back and I have to say it was one of the best birthday presents I'll ever receive. 2) What's Cooking? This is a small cookbook in the way that it can be fit in my purse to take with me somewhere but the actual inside is very large. It is chock full of fantastic recipes. There aren't any photos and it's a collective cookbooks from a bunch of balebustas & if I'm not mistaken my sister in law partook in creating this cookbook by adding some of her own original recipes and she is seriously one amazing cook! 3) The Bais Yaakov Cookbook- My landlady gave this to me as a gift for helping her with something small on the computer. It was so generous of her. The photos are stunning and most of the recipes are great! I like the big lettering and easy instructions as well. My favorite recipes are the two Tuna Steak recipes which we have enjoyed several times. 4) The Kosher Palette II by Joseph Hebrew Academy Kushner- You can see how much I have enjoyed this one by the wear of it. This was a part of the birthday gift I mentioned above. There is a recipe in every category that I can not be without and my favorite thing about this one is the large variety of fish recipes of all sorts in it. 5) The At Home Gourmet by Sarah Lasry- This is a newer addition to my collection. I received this in a swag bag at a blogger event this summer. As soon as I opened it I knew it was a great one. 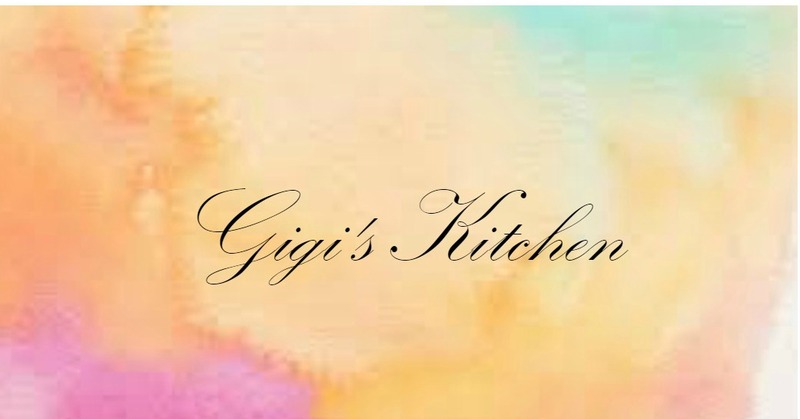 It is full of creative ideas and fabulous recipes. My favorites are the goat cheese salad and the "unstuffed" cabbage. Go check out Sarah Lasry's Blog you will love it! 6) Winter Gatherings by Rick Rodgers- ok so I have literally mentioned this one about a million times here on the blog ever since taking it out from the library. It is simply amazing! Every recipe I have tried so far has been delicious and it's the perfect thing for this time of year when soups, comfort food and warm drinks are all I think about. 7) Gordon Ramsey's World Kitchen- Another one from the library. If you don't know who he is go google him. He is seriously just a superlative chef who is so inspirational to me! This cookbook is lovely, it's full of recipes from all different cuisines across the world. 8) The Whole Foods Kosher Kitchen by Levana Kirschenbaum- This one is brand new. In fact I only received it last week. I won another giveaway. I know what's the chance? I was so surprised and excited to hear it and I was sent this by Tales of an Overtime Cook after winning her giveaway! Thank you Miriam! I know that I love this cookbook already even without having cooked a single recipe. The pictures, the recipes, the vast amount of information inside etc. are what have me convinced. As soon as I begin using it in my kitchen there will be a full review here on the blog. So if you are looking for a new cookbook any of these would make great choices! These are the ones I have been enjoying lately and have been turning to when I'm in a bind. What is your favorite cookbook? I would love to find another great one so let me know in the comments form below.